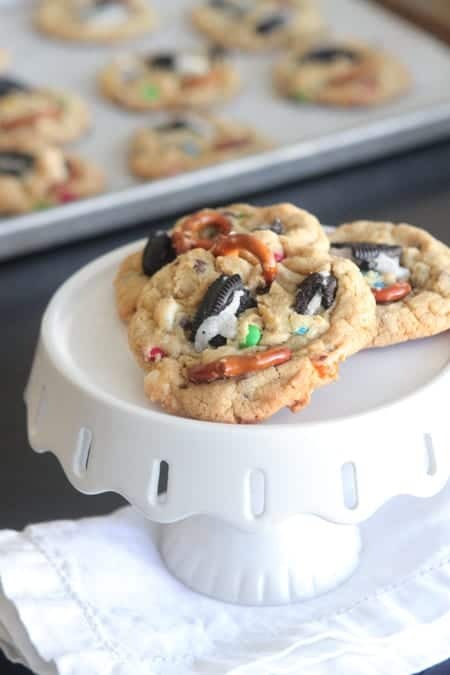 My Celebration Pudding Cookies make the perfect cookie to celebrate your family and friends. You are in for the ultimate treat with my Celebration Pudding Cookies! Get your baking supplies out, you’re going to want to make these ASAP. Packed with all of my favorite goodies, this one’s a winner! Enjoy friends! What Else Can I Add To My Cookie Dough? There are so many options of goodies you can add to your cookie dough. My favorites have been added, but here are more ideas for you! *Other varieties of nuts. Pistachios are a favorite. *Reese’s Peanut Butter Cups, coarsely chopped. 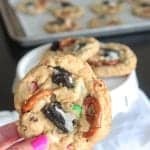 Such a fun cookie to surprise your family and friends with. Looks awesome packaged up in a cellophane bag with bow. 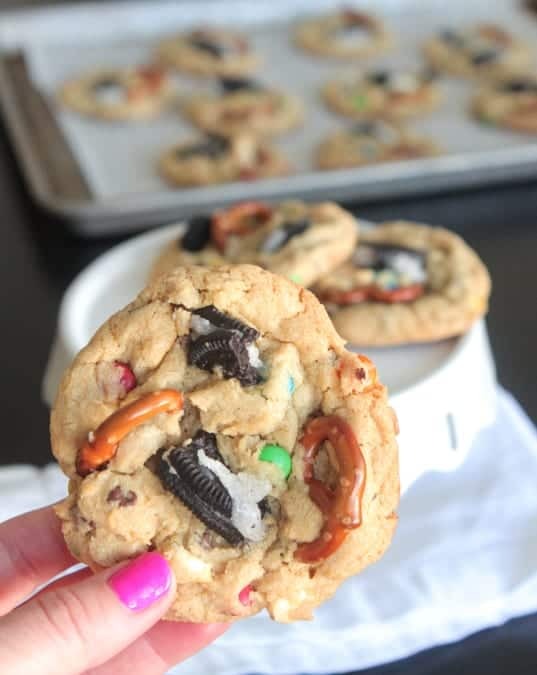 For more Picky Palate cookies click HERE. *Add any of your favorite candies or nuts for other versions! 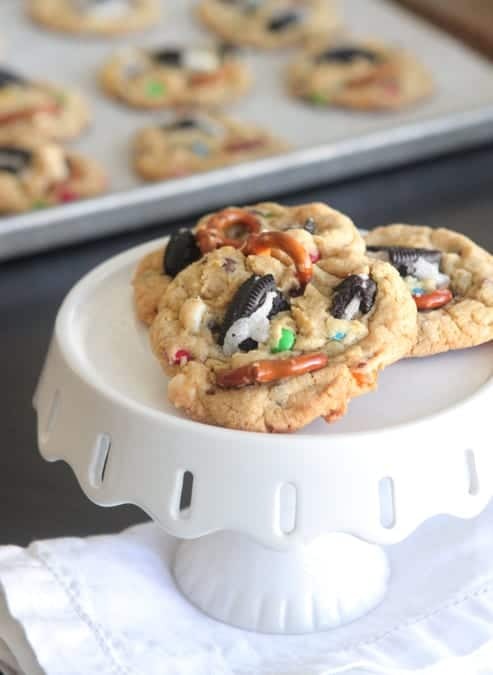 *Store any leftover cookies in an airtight container, room temperature for 2-3 days max. *Read your recipe carefully and make sure you have all of your ingredients on hand before getting started. *Use good tools and utensils. Assemble all the bowls, pans, and utensils you will need on your counter or worktable before starting. Use standard measuring cups and spoons. *Use good quality ingredients. You can not expect a first-rate product using second-rate ingredients. Be sure your ingredients are fresh and of the finest quality. Check expiration dates of baking soda and things that might not get used up quickly. *Have all ingredients at room temperature for more glamorous perfect cookies, unless otherwise specified. Place butter and sugars into a large bowl, mix well. Add egg and vanilla stirring until well combined. Stir in flour, baking soda, salt, pudding, chocolate chips, M and M's and white chips. Stir until dough forms. Scoop onto prepared baking sheet placing 1 inch apart. 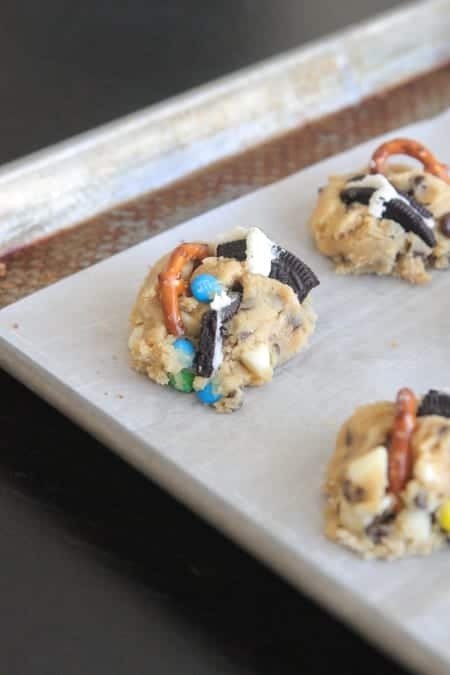 Press 1/2 of a mini twist pretzel and 1/2 or even 1/4 of an Oreo Cookie onto tops of each cookie dough pressing slightly. Bake for 12-14 minutes, until cooked through. Remove and let cool completely before serving. I think which article you shared for your daily readers is look like very wonderful because you wrote with the hearts and give best recipe which are always awesome. You just keep you share for your viewers. 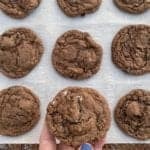 What size cookie scoop do you recommend for this recipe? They look so delicious! Definitely gonna pick up some pretzels & m&m’s on my next grocery run.